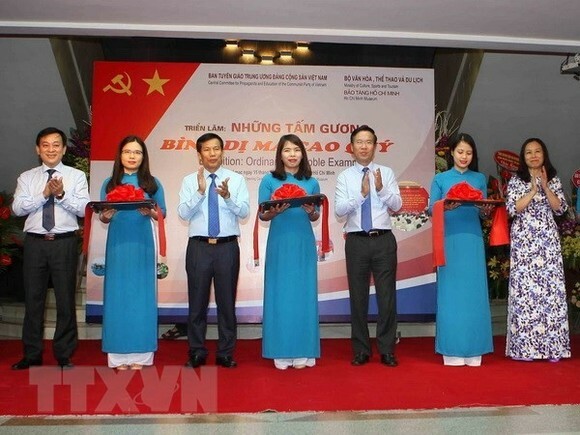 An exhibition titled “Great simple examples” honoring typical individuals and groups in the national campaign, “Studying and following President Ho Chi Minh's thoughts, morals and style”opened at Ho Chi Minh Museum in Hanoi on May 15. Attending at the opening ceremony were Head of the Party Central Committee's Commission for Communications and Education Vo Van Thuong, Minister of Culture, Sport and Tourism Nguyen Ngoc Thien. The display presents to viewers 300 photos, objects and documents of 56 groups and 70 individuals who were selected from 300 typical examples by departments of Propaganda and Training and Party committees of provinces and cities nationwide. The event which is organized the Party Central Committee's Commission for Communications and Education aims to mark the 128th birth anniversary of President Ho Chi Minh (May 19) and two years of implementation of the Political Bureau’s national campaign, “Studying and following President Ho Chi Minh's thoughts, morals and style”. The exhibition will run until September.